New York City’s Theater District is an area in Midtown Manhattan where most Broadway theatres are located, as well as many other theaters, movie theaters, restaurants, hotels, and other places of entertainment. It extends from West 40th Street to West 54th Street, from west of Sixth Avenue to east of Eighth Avenue, and includes Times Square. It also contains recording studios, record label offices, theatrical agencies, Music Row, ABC Television Studios, Duffy Square, Shubert Alley, the Brill Building, and Madame Tussauds New York. Although 42nd Street had become seedy in the 1970s, with x-rated stores the neighborhood was later improved with the closing of many of these businesses. The Theater District first began to attract theaters and restaurants to the neighborhood after the Metropolitan Opera House moved to West 39th Street and Broadway in 1883. The district has been called “the Rialto”, “The Main Stem”, “Broadway,” and at the turn of the 20th century the district was simply called “The Street”. In the Spring of 1982, Joe Papp, the theatrical producer and director who established The Public Theater, led the “Save the Theatres” campaign. It was a not-for-profit group supported by the Actors Equity union, to save the theater buildings in the neighborhood from demolition by monied Manhattan development interests. The Save the Theatres campaign then turned their efforts to supporting the establishment the Theater District as a registered historic district. 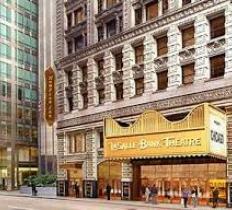 In December 1983, Save the Theatres prepared “The Broadway Theater District, a Preservation Development and Management Plan”, and demanded that each theater in the district receive landmark designation. Mayor Ed Koch ultimately reacted by creating a Theater Advisory Council, which included Papp. The Times Square Alliance, a Business Improvement District organization dedicated to improving the Theater District, defines the district as an irregularly shaped area within the bounding box of 40th Street, 6th Ave, 53rd Street, and 9th Ave. The Great White Way is the name given to the section of Broadway which runs through the Theater District.